The Bengal is a hybrid cat, resulting from the crossing of a domestic cat with an Asian leopard cat (ALC). The name Bengal doesn't apply to the cat until the 4th generation, when they are considered to be stable and domesticated. Pet Bengals are wild in looks, but not in personality. This breed is alert, energetic, active, muscular and intelligent. They usually get along wonderfully with other family pets. Today most Bengals are about the size of a large domestic cat. Female Bengals average from 7 to 11 pounds at maturity, while the more heavily muscled males can average from 11 to 18 pounds at maturity. They are well known for their beautifully spotted or marbled coats with high contrast between the pattern and background colours. Bengals come in two coat patterns, spotted and marbled. The spotted should be formed in a random and horizontal pattern rather than vertical. Rosettes are preferred over plain spots but good contrast is more important. The marbled pattern should flow horizontally, and should resemble marble. Their colours come from the wild--black, brown or rust on bright shades of tan, gold or mahogany. Like its wild counterpart, a white version of the Bengal is called a snow. The preferred pattern is leopard spots, not tabby stripes, on legs and ribs. Ivory-to-white undersides and small, rounded ears also are desirable. What are their temperaments like? Temperament is of a major concern, both to breeders and to pet buyers. Today carefully bred Bengal kittens from reputable breeders have loving, outgoing personalities. The instinctive suspicion of the wild cat has been bred out through careful selection. The two main things breeders look for are sweet temperament and a beautiful, wild appearance. First-cross (F1) hybrids are often shy, nervous, untouchable cats, much like their wild ancestors. Like mules, first-generation hybrid Bengal males are infertile, but their F1 sisters can reproduce. In subsequent generations, males are fertile so out crosses to domestic cats are no longer needed. In fact, they are undesirable because breeding back to domestics dilutes the wild inheritance. Well-bred Bengals are affectionate, purr enthusiastically and are exceedingly intelligent, a trait probably inherited from the wild cat's natural selection for jungle survival. They use the litter tray, like to climb and run, and are quick and curious about everything. Bengal owners report that their cats retrieve, learn tricks and love water, sometimes coming right into the bath or shower to play with human toes. When Bengals are excited, their tails fluff up into massive raccoon-like tails. Even as adults, Bengals are entertaining and playful, but as in other breeds of domestic cats, they vary greatly in appearance and behaviour. In general, skittish, fearful kittens seldom become affectionate pets, but they may bond to certain family members. Bengal kittens often go through an ugly stage of fuzziness between 2 and 6 months of age in which the clearly contrasted markings are spoiled and blurry. This muting is probably nature's way of protecting the young; baby cheetahs go through a similar fuzzy stage. Then, depending on the seasons, the fuzzy coat falls out and the colouration returns, unless, of course, the kitten was grey (tawny) at birth. All Bengals must have a black tail tip, regardless of body colour. The marbled has no counterpart in the wild, and in captivity no two marbled Bengals are alike. The pattern may be sharply defined patches of colour; reminiscent of a stained glass windows, or flowing, twisting streams of clear colour. Bengals are no different than any other domestic cat when it comes to care and feeding. Female Bengals average from 7 to 11 pounds at maturity, while the more heavily muscled males can average from 11 to 18 pounds at maturity. 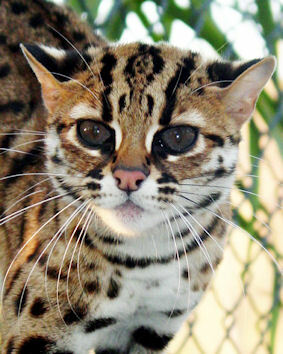 The pedigree Bengal cat can have many different colourings or markings depending on it's breed line but most share a feature unique to Bengal's, glitter. Glitter is defined as a hollow air shaft that surrounds the colour on the hair. In a way the fur actually "glitters". Even the voice of a Bengal is different from that of other domestic cats. It has been described as a cooing or chirping or as a strange gravelly sound. They have a wide vocabulary that may on occasion be quite strident especially in unfamiliar situations. This should not be confused with aggression; it is an individual means of expression. Their vocals can vary from cat to cat but they are noted for a "yowl" sound. They can be very persuasive about this. The translation to our language is most likely, "You WILL do what I want now!". They also have an interesting chirping noise and a strong steady purr.